"The quick baking option can turn out a loaf in about two hours." "An LCD screen shows the progress of the baking." "It only makes one-pound loaves, but the process is nearly automated." "If you’re bread-baking on a budget, this has features of more expensive models." "Designed to be user-friendly, even for folks who haven't baked bread before." 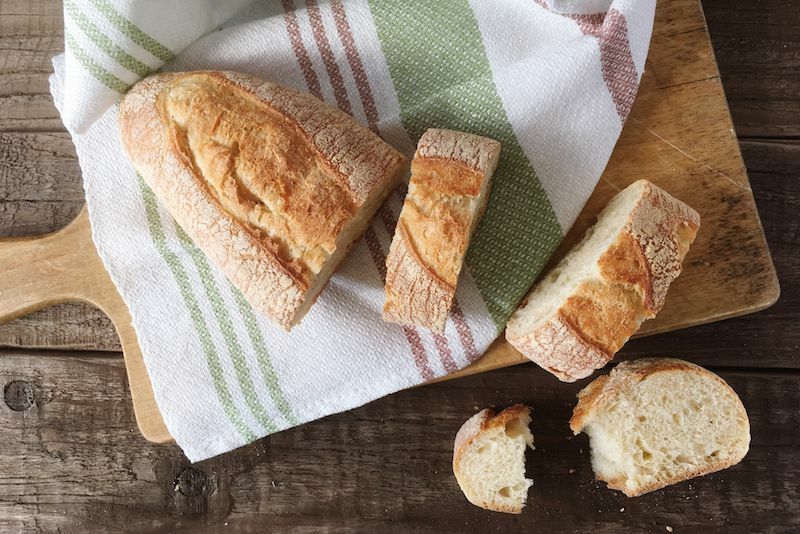 "Nearly foolproof results for each type of bread." "Settings for gluten-free salty, gluten-free sweet and gluten-free cake." Zojirushi has been making higher-end bread machines for quite some time (and this is one of their best). It makes a two-pound traditional rectangular shaped loaf and has two kneading paddles to efficiently knead dough. The pan is nonstick, for easy release of the baked loaf, and for easy cleanup. Like many other bread machines, it has custom settings, including a gluten-free option, while the quick baking option can turn out a loaf in about two hours. The LCD control panel makes operation easy and baking can be delayed for up to 13 hours. Crusts can be set for light, medium or dark, while settings include basic, basic wheat, basic dough, quick, quick wheat, quick dough, jam, cake, sourdough starter and home made recipes. The one thing that sets this machine apart from other bread makers on the market today is the additional heater on the lid that bakes bread more evenly and browns the top crust better. It also has a large window on the lid, so you can check the kneading and baking process without releasing heat. When you open the lid, the kneading process pauses, and it resumes when the lid is closed. The machine alerts you when it’s the right time for add-ins, such as nuts, fruit or other ingredients, and it signals when the final knead is done, so you can remove the paddles and shape the loaf by hand, if you prefer, or you can remove the dough to shape, rise and bake in the oven. While this doesn’t have settings for different sizes of bread, users have said that they have been able to bake other sizes of bread with the machine. This includes a measuring cup and a measuring spoon. A close tie for the best bread maker, this customizable machine bakes loaves in four different sizes—one pound, 1.5 pounds, two pounds, and 2.5 pounds, so you can choose exactly the size you need for a small family or for a big dinner party. The fruit and nut dispenser lets you set up your add-ins (up to 3/4 cup) ahead of time, and it automatically adds them to the dough at exactly the right time. A unique feature of this machine is the collapsible kneading paddle that mixes and kneads the dough, then collapses before the baking begins, so there’s less of a hole in the finished loaf. The baking pan is non-stick for easy bread release and simple cleaning. This has an LCD screen that shows the progress of the baking and lets you choose from among 13 different automatic settings, including custom, basic, whole wheat, rapid, gluten-free, crusty loaf, sweet, yeast-free, dough, pizza, pasta, bake-only and jam. You can also set one of three different crust colors and four different loaf sizes. You can also delay the cooking time and turn off the audible beeps if you don’t want to be disturbed. The bread maker has a window on top and an interior light that makes it easier to see the bread as it bakes. Because this has only one paddle, it has to work a little harder to knead, so it bounces around a little on the counter. The exterior also gets hot during baking, so care should be taken. If you like the idea of having a bread machine on your counter, but you want to minimize the space used, this machine is taller than it is wide. It only makes one-pound loaves, so large families might need to bake more often—but fresh bread every day isn’t a bad thing, particularly when the process is nearly automated. This machine has many of the same features as bigger machines, including a delayed baking option, an LCD control panel, a window to allow you to monitor the kneading and baking, as well as a non-stick baking pan. It also has a carrying handle that makes it easy to move the machine for baking and move it into storage when you’re done. This has settings for basic bread with regular, firm or soft texture, French bread, dough-only, cookie/pasta dough, cake, jam and quick breads. This is more expensive than some of the other small machines, but it’s built to last. If you’re bread-baking on a budget, this machine can make up to a two-pound loaf and it has many of the features of more expensive machines. It has 12 different bread settings (basic, French, whole wheat, sweet, 1.5-pound ultra-fast, two-pound ultra-fast, quick, European, dough, bagel dough, jam and bake) and three different crust settings. The Expressbake function can make bread from start to finish in under an hour, so you can have a fresh loaf for dinner, even if you forgot to set it up in advance. The LCD indicates the baking progress, while a keep-warm setting lets the bread stay warm until you’re ready for the loaf. This has a smaller footprint than many bread machines, but the resulting loaves aren’t quite a standard rectangle. While it’s great to have a bread machine with a lot of options, sometimes those can be intimidating for new users. This machine is designed to be user-friendly, even for folks who haven’t baked bread before. It has a window on top, so you can watch the loaf as it kneads, rises and bakes. It has 19 different automatic settings that take all the guesswork out of baking the proper loaf, including basic, quick, sweet, French, whole wheat, rye, potato, oatmeal, beer bread, rice bread, gluten-free, dessert, mix, dough, knead, cake, jam, yogurt and bake. The manual includes recipes designed for each of those settings, so there’s no need to guess what will work. It has settings for light, medium or dark crust, and one-pound, 1.5-pound and two-pound loaves. It also has a 15-hour delay timer, a one-hour keep-warm feature and it can recover from up to 15 minutes of interrupted power. The unique feature on this bread machine is a convection fan that provides nearly foolproof results for each type of bread. That convection heat results in a better crust color and bread texture, no matter which of the 16 settings you choose (white, rapid white, whole wheat, rapid whole wheat, French/Italian, rapid French/Italian, quickbread/cake, low carb, gluten-free, dough/pizza dough, artisan, sweet bread, rapid sweet bread, jam, last-minute loaf and bake-only). There are also settings for three different crust colors and three loaf sizes. An audible tone lets you know when it’s time to add your mix-ins, while another tone lets you know when kneading is done, so you can remove the paddles, if you like, or remove the dough to form, rise and bake in the oven. A 12-hour delay timer lets you plan your baking ahead of time and there’s a 15-minute pause feature in case you need to hunt for the raisins that you wanted to add to the loaf. A power failure backup makes sure the machine resumes when power comes back on. The artisan dough option lets you take the bread through several long, cool rises, while the last-minute loaf gets your bread done quickly. The bread pan is non-stick for easy release of the bread and quick clean-up and a window on top lets you check the bread as it kneads, rises and bakes. While most bread machines these days have one setting for making gluten-free breads, this one was designed with gluten-free baking in mind. It has settings for gluten-free salty, gluten-free sweet and gluten-free cake, along with settings for standard baking, including rapid whole wheat, whole wheat, salt-free, super-rapid, rapid sweet bread, French, sweet, cooking, dough, cake, jam and pasta. This makes bread in one-pound, 1.5-pound and two-pound loaves. It has three different crust settings, as well as a 15-hour delay timer and an automatic keep warm feature. The LCD screen makes it easy to choose the right settings and the lid has a window, so you can check the progress of the kneading, rising and baking. The pan is non-stick for easy bread release and simple cleaning. This includes a measuring cup and spoon.